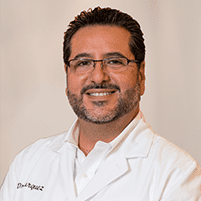 Dr. Burquez has special training in the Invisalign orthodontic treatment system, designed to help teen and adult patients in and around Chula Vista and Bonita, CA, get the beautiful smiles of their dreams without the need for traditional braces. Invisalign® is an orthodontic treatment system which uses clear plastic trays instead of wires and bands to help straighten teeth and correct issues like overbites, underbites, crossbites and other alignment problems. What are the benefits of the Invisalign® system? They're smooth, so there are no sharp wires or metal edges to cut into gums or cheeks. They're clear, so they're almost invisible while they're being worn. They're removable for eating, brushing and flossing, so there are no dietary restrictions and it's much easier to keep your teeth and gums clean and healthy. They can be removed when necessary for picture-taking or other events. They're custom-fit for your mouth, so treatment may be faster. Invisalign® offers products for both adults and teens whose full set of adult teeth may not have emerged yet. However, there are some cases where Invisalign® is not the best option. During your consultation, you'll learn about whether Invisalign® is the best choice, and you'll have a chance to learn about other options as well. Is Invisalign® more expensive than traditional brace? Yes, Invisalign® does tend to cost more than traditional braces. Most treatments with Invisalign® can be completed in 18 months or less. What is the Invisalign® procedure like? Invisalign® treatment begins with impressions of your teeth. These impressions are scanned into a computer and special virtual models of your mouth are created to show the movements your teeth will need to make to come into alignment. The plastic trays are created based on those models. You'll wear each tray for about two weeks, then exchange it for the next tray in the series to keep your teeth moving into their proper positions.